Bought both Affinity Photo and Designer. Was hoping they could replace Adobe apps, it has to be said (and is many times on this forum) the Affinity software is very good, very good indeed, but after buying the software I find that I don't use it, can't use it really, not because I don't know how, but because it will not do the job in hand ...at least at the moment. Affinity Photo is being called a Photoshop killer, I wish it would, but Photoshop many many years ago stopped being a photo editor/touch up tool and became a graphics suite for image manipulation and lets be honest Affinity Photo is not, so therefore can't be considered even slightly a Photoshop killer. In a hobbyist sense for photo touchup ok it is, but then again isn't Photoshop Elements, for a full graphics suite the lack of creative filters hold it back from lurching in to an attack on Adobe software. I can cope with limitations on features I can work with workarounds on features, but when there is not even a basic feature in place then the software is redundant. Lets face it, the oil painting, palette knife, watercolour filters in Photoshop do not get used for these effects, they are poor in Photoshop if that is the outcome, but it is the combinations of these filters on blended layers that get the effects e.g. Blended layers of Cutout filter layer, plastic wrap layer, Neon Glow - desaturated and inverted and Distortion Glass applied with a good number of steps and filters in between to produce convincing paint and sketch effects. I would have thought these creative filters would have been one of the more important and primary features for Photoshop replacement consideration (in addition to standard Photo Editing capabilities that appears on all the different varieties of image editing software such as curves, masks, selections etc). Designer however is getting close to commiting the vigilante act with Illustrator, now that is a cracking piece of software, it isn't Illustrator yet, but is getting there. Creating 'low poly' art in Designer is an absolute pain as I personally find the ink dropper/selection workflow an absolute pain to use. Designer does need more of the effects (distort/transform types) to be implemented. I realise that there is much love and praise for Affinity apps on here, and so there should be, but am aware saying anything detrimental or critical on a loyal forum can result in a barrage of abuse and 'telling off'. But please if you are inclined to do so please consider this thought, I have brought this up as somebody that rarely if ever contributes to forums of any kind, I really want Affinity to replace my current workflow, have been patiently trying and evaluating software open source, trial software for the last 15 years for something that will replace the Adobe workflow, there have been few that have shown promise but then either stagnate or stop development. I am really hoping Affinity is here to stay and make my comments on the basis that myself and I'm sure other people really need these features. Secondly I have not just used the trial, but have bought this software even though it is quite frankly of no use to me yet, and I am not rich, am I disappointed, well in one respect yes because even though I want to, I can't yet use it, I can't drop Adobe yet until the features are in place, but... I am happy to buy this software though, play around with it from time to time, to get used to the interface and differences ready for future version switchover, in the hope that my contribution in buying the software continues the development of the apps and longetivity of Affinity. Without being too out there, Photo and Designer in one app? Now that would be something, no switching between apps for design work, even Adobe can't do that one (probably more from a business point of view than application development). Three apps to choose from Photo, Designer, Photo-Designer prices adjusted accordingly I'd happily pay the combined price or more even for the latter. OK, thanks for reading, hope it does slightly resonate with some. I'm not sure we are marketing it as a Photoshop killer. I think that idea comes from the reviews on net, comments on social media etc. Affinity Photo and Designer are our own view/project on photo and illustration editors. We are not aiming to clone Photoshop nor Illustrator. We are also trying to keep our apps focused on specific/defined areas, so don't expect 3d or animation features in Photo for example. I don't think it's fair to expect them to replace or cover all Photoshop or Illustrator features at this point. Affinity is a new line of software - in its first version -, created from scratch and developed by a small team. It can't offer the same functionality as other apps on the market and in development for more than two decades, so you may find a few features missing. We are however doing our best to close the gaps as fast as we can. Artistic filters, to pick an example you mentioned, will be added in a future version. For information on what's coming/planned for the next months (for the entire 1.x cycle) please check Affinity Photo's roadmap and Designer's roadmap. We keep the applications separate because we want them focused on a single area. Users that are interested in photo-editing for example don't have to pay for illustration features they don't use. This doesn't mean we have sacrificed integration with the other apps of the suite. You can switch documents between the applications going to menu File ▸ Edit in Photo/Designer (depending on the app you are in) without the need to save the file. You can also edit/adjust features that were created on another app of the suite inside the program you are in without switching to the original application where they were created. For example Live filters added in Affinity Photo can also be edited/adjusted inside Designer without switching apps. You can also open files created in any of our apps in whatever app of the suite you want. All are able to open files from the other apps, as well as use files created on the Mac on the Windows versions and vice-versa. This allows us to keep an accessible price for each app, maximise their features/scope for each area (photo, illustration, and desktop publishing later) while still maintaining interoperability between all the apps of the suite in the platforms we support. Hope this helps to explain some of the points/questions you raised. If you have any questions or trouble achieving something just post on the forums. There's plenty of staff (including developers) and experienced users willing to help. Thanks for your support. It seems there are quite a number of people who show up on the forum expecting the Affinity apps to be a replacement for other, more mature, and generally much more expensive software. And often they are disappointed. I think its more a matter of expectations being let down (I too have read the PS-killer stories) rather than the software being flawed. As MEB noted, the apps are quite young. Give them a few more years. I think AP should aim to be a Photoshop killer in areas of prepress and basic photo editing. These are quite well defined tool sets and provide focused development target. Without being too out there, Photo and Designer in one app? I'm going to suggest that the names "Photo" and "Designer" were chosen advisedly to reflect specific use cases and target audiences: I, for one - for all I know a typical user of Photo (that is, a digital photographer, pure and simple) - have absolutely no interest whatsoever in a combined solution: to me that'd just be a giant stride towards the kind of bloat that the lack of makes Photo so appealing to photographers. That's really, deeply patronising: I personally know professional wildlife and sport photographers who use Affinity Photo in their production environments, right now. I'm not sure we are marketing it as a Photoshop killer. Indeed - and thank the Lord for that. Photo is a fantastic alternative to PS for many of us, but the idea of a PS "killer" implies the addition of a plethora of functionality which - let's be honest - most PS users (much less Photo users) neither use nor want: it's axiomatic that very many PS users who are photographers (not "digital artists", "retouchers", "image manipulators", etc.) use only a limited subset of PS' capabilities, and Photo being designed and developed to reflect that focused (bad pun intended) use case is a damn' good thing. Maybe its time to count how many photographers, designers, DTP artists... are between Affinity users. If most of them are photographers -- then fine. Everything is OK. But if there are more designers, then merging Photo and Designer into one app is must. Designers are not interested in vector or bitmap tools as such. They use everthing they have to make art -- sometimes with vector tools, sometimes with bitmap tools. So, it is ridiculous to switch the applications every second. I thank too! Every day since the change to AP. It is not even valid for all "digital artists", "retouchers" or "image manipulators"! Sincerely I am very sorry if I have upset people, Keith if that sounded patronising, it really wasn't meant to be, I really am not that type of person, if you had a pint with me you would see that, but forums with the written word are very clinical and when no body language or expression is included in discussion. 'OK' may sound similar to 'meh' it was meaning as in it does the job. And hobbyists, I mean people that do not need to access to different capabilities at different times with jobs that vary but instead have more a personalised work flow that uses a regular set of tools for their own interest/purpose and may not need to call in capabilities that are beyond this. If the intention of Affinity is not to replace, compete or provide alternative to a wider Photoshop user base and focus mainly on the needs of Photographers that would be a real shame. Then the discussion should probably be Affinity Designer you are aimed designers and that market sector, can we have bitmap editing features and creative filters if it is not a factor with Photo. There really is no alternative to Photoshop on the mac, or putting it another way alternative for the Photoshop user base, I'm not afer a lower cost clone, but something that performs the task in hand. GIMP is good, very good and should be commended for the effort developers put in to it giving up their time at no cost, but it has no CMYK and a number of other things mentioned many many times. Pixelmator is again very good, it has addressed CMYK but lacks in other areas, (you just keep trying to find an alterative solution). Affinity Photo through experimenting and experience with it ticks all the boxes, but the lack of creative filters closes it down, if this is going to be of detriment to the photography fraternity by ruining the experience through bloat etc then I can understand it not moving in to further areas of potential customer need. As discussed time and again, the Adobe leasing system has put me off completely, to get just Photoshop and Illustrator it means it is more or less the same cost of getting the whole suite at roughly £50 a month. I prefer to buy my software, have for as long as I need it and upgrade when I need to, which has mainly been due to OS updates, I'd still happily be using CS5, but on Sierra, Illustrator CS5 constantly crashes and as it is old it is no longer updated/supported forcing an upgrade, with the Adobe software approx £600 per year (£50 x 12months) as opposed to £650ish every 4 years (or more). I’m not brand loyal with anything, whoever offers the goods and is fair gets my custom. I moved from Windows to Apple in about 2003 due to my windows PC requiring constant attention with Firewall, Antivirus, Ghost clone backups etc, I found I was having to spend a lot of time looking after my computer like a Tamagotchi, things I’m sure are probably different now though on a Windows PC. Apple itself has gone from the underdog with a good customer ethos and solution provider to the ‘Master and Commander’ of the customer experience dictating in some ways how and what the customer gets and should act, you will have your music like this, you don’t need a USB port use an adapter instead etc, I’d move to Ubuntu Linux today if it had the graphics tools, it is really nice to use I put it on an old netbook, however I could really not live without Cheetah 3D which is fantastic and Mac only, the software/tools dictate my OS. Adobe has a monopoly on the mac for the wider graphics community, if there is a potential contender you want it to succeed, I have considered Affinity as being that contender, Photo is 90-95% there for what I need, Designer is there apart from the colour picker and distort effects, but can put up with that aspect if needs be by being a bit more long handed with what have been accustomed to. If the two pieces of software are aimed at just two different discrete user bases photographers and vector illustrators and not the bridge in between that is a lot of potential users out of the game. On the original post I suggested three versions Photo, Designer, Photo-Designer as being something great, not consolidating them both in to just one package only. The option for bloat not bloat would be there I guess. Genuinely sorry if I have rattled cages or irritated people, I’ll keep quiet from now on and go back to my former life as a reader only. Affinity Photo through experimenting and experience with it ticks all the boxes, but the lack of creative filters closes it down, if this is going to be of detriment to the photography fraternity by ruining the experience through bloat etc then I can understand it not moving in to further areas of potential customer need. We are however doing our best to close the gaps as fast as we can. Artistic filters, to pick an example you mentioned, will be added in a future version. For information on what's coming/planned for the next months (for the entire 1.x cycle) please check Affinity Photo's roadmap and Designer's roadmap. I'd argue that AP is not Instagram and such weird filters should not be applied but like you mentioned the use for others "creative" options, that is valid for sure. No worries. I don't think you have upset anyone. I'm sure we all know sometimes it's not easy to pass the correct idea through the written words and a few things may be misunderstood. There's plenty of space here to expand/clarify whatever needed. I just want to make clear that Affinity Photo wasn't designed designed specifically for photographers only - it's a RAW converter/developer and photo editing/painting app. Those are its key areas, so it can perform similar functions as Photoshop (work with selections, channels, masking, filters etc for localised editing for example). Likewise Affinity Designer is an hybrid raster/vector design software. It can be used for graphic/web/ui design and illustration purposes. The photo editing and illustration areas i mentioned in the first post were meant to be a very generic description/classification of what they are/fit. Fair enough, Ben - I appreciate the clarification. Isn't Pixel Persona in AD just what you are looking for? It's a bit unrealistic to expect one application to "do it all", and risking that the various components are lacking in comparison to specialist software. 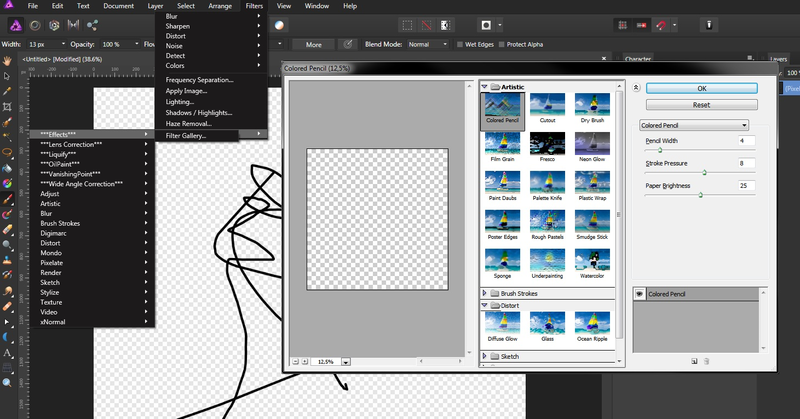 Xara and PhotoLine combine both vector and bitmap editing, but those miss other things again. No tool is perfect. I do not paint in Photo or Designer or Photoshop - I prefer Krita and Clipstudio, because their primary focus is digital painting and sketching, and they do it way better than those three. I prefer Cinema4d and Blender for 3d work and lettering: even with Photoshop's 3d functions, I find Photoshop's 3d to be way too limited for usability, features, and output quality. If I need to do publishing, I prefer InDesign (although I hate the subscription). The problem is also knowing where to stop: some people need a super chart tool, others responsive web mockup tools, and yet others again require perspective projection tools with z-channel support, or animation/video timelines. Where does it stop? To combine all of this into one application would cause bloat, and from a developer's point of view it becomes a nightmare to maintain. In my opinion the trouble is that so many different users from widely different backgrounds expect a tool that does "everything". That is an unrealistic expectation. So much quality specialist software out there - Affinity should not be trying to reinvent the wheel, but improve the carriage that carries its users instead. Nor should a designer expect any single software app to "do it all". Instead, improve file exchange abilities between software. Ideally an open design format that supports seamless collaboration between widely varying apps would be the holy (utopian) grail. On the 3D side- Affinity is MUCH, MUCH better for the average 3D user wanting to composite and work with higher range images etc. It's an area that PS totally lacks in. As Rayek said- anyone remotely serious about 3D is going to download/use a dedicated 3D application. Maybe there is a workflow that is different than I'm use to, but I have yet to see a good day to day use of either PS or Illustrator's 3D tools (which are horrible). Of the retouch people I know, they like affinity, but say it doesn't have all the tools they need yet. For all the people that seem to only need some PS features, but need higher bit depth editing etc. then Affinity is a better fit- and they love it. Affinity needs to stick out of the pack, not just be a me-too app. I'd say so far, with the price and differentiating features it's doing that well. I haven't seen a product line like the Affinity set actually give Adobe users an honest second look in probably 20 years. Even if it doesn't live up to expectations, just the fact it IS viewed as an alternative says they're doing the right thing development wise. This can be said for any application, not only for those all-in-one. Software owners / developers just search for excuses not to make all-in-one apps. There are problems in every software development. There are missing features, also. All problems start from the very beggining of the project. Lack of good ideas, concept, strategies... to mention just a few reasons for bad apps. It doesn't matter if they are all-in-one or not. When I need to write any software, I spend 90% of the time in thinking and the other 10% in writting it. After that, normally, testing is needed. Too easy to state that developers "just search for excuses not to make all-in-one apps". We call that a generalization. What exactly would become part of that magical product that can do it all? Where do you stop? So many users who have all these different wishes and workflows - how can you implement those all right from the start? YOU CAN'T. You have to make choices, and adapt to changing conditions in the market, and user wishes. You cannot plan ahead for everything. No, that is not the way to do complex large-scale development such as Affinity. User testing must be integrated right from the beginning. Software development is an evolutionary process, a communication and learning process for all involved parties, which generally needs a lot of feedback for application oriented development, in order for a project to be successful. Ideally here with a lot of author-critic-cycles (analyze-, evaluate-, model states) from the beginning up for the specific application domain. Iterations and development documentations are also an important project part of this. As a bunch of other things. - In short, there is much more to take into account and care of in software engineering, as some people commonly do think. I looked into adding all kinds of *.8bf files from Photoshop to test how obfuscated they are. but it won´t change the images since Affinity Photo is internally vastly different. to being able to build a tailored and quicker way of getting the wanted results. This can be said for any application, not only for those all-in-one. Software owners / developers just search for excuses not to make all-in-one apps. Software owners / developers just search for excuses not to make all-in-one apps. There is no need to search for excuses. There are quite a few very good reasons not to make all-in-one apps. Among them are all the well known problems associated with feature bloat, like increased development costs, longer development times, more obscure bugs to eliminate, the near impossible task of optimizing the code to do everything reasonably well, ever more complex & difficult to understand user interfaces, & higher demands on system resources. Would have known Petar would have been right on any thread talking about "all in one apps". Anyway - our (well documented) reasons for having separate apps haven't changed in three years. Have Ad0be released their "all in one app" yet?